For now, my little collection is resting inside a sea grass etched martini glass. Might see if I can find some fabulous bowl this week - time to go haunting some antique or vintage stores in the Bay Area for just the right thing! I like the juxtaposition of using a beautiful, perfect display piece filled with my bits of sea glass and shells worn smooth by the tide. Easy way to show off your precious finds in any kind of setting - formal or casual, who can deny that sea glass is almost like finding buried treasure? Mix up the colors - or use one color to fit your personal decorating scheme. Only limited by your imagination! 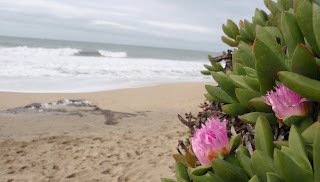 Went for a sunny walk yesterday at Poplar Beach at Half Moon Bay (Poplar Beach story! 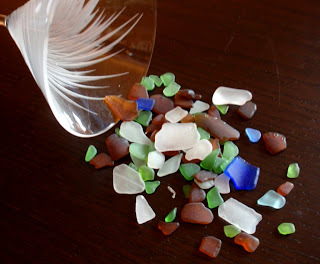 ), and came home with my pockets full with tiny, sand-washed and tumbled pieces of beach glass! 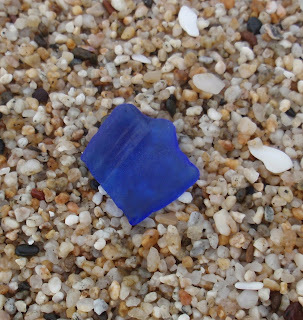 The sea glass on Half Moon Bay reminds me of the glass that I find in Port Townsend, but worn almost flat, whereas the glass in Port Townsend is like little round pebbles. Walking on Poplar Beach can be a little bit of a challenge - the sand is soft, deep, and very grainy, and you don't dare take your eyes off of the surf! Unlike Washington beaches, this beach sand color is like soft butterscotch or caramel - littered with shells that have been literally pounded into submission by the Pacific Ocean. 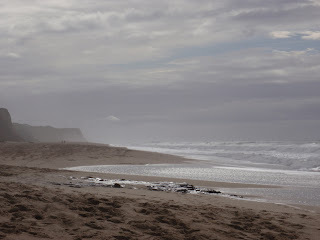 Will let the remaining images of a walk on the beach at Half Moon Bay speak for themselves! great piece of cobalt there!! Awesome find. It must be beautiful to find such treasures. My beach visits to the Florida Panhandle don't turn up such finds though I'm always on the lookout. What wonderful treasures! And definitely a great way to add the majesty of mother nature to your home decor.